If you are currently using our full scale Broker Brain system and wish to move to Broker Brain Lite, there are a few important things you should know and a few critical things you need to do in order for your system to function properly. If you have been operating in a multiple market structure, be aware that once you transition to Broker Brain Lite, you will have only one market available. Properties assigned to secondary markets must be moved to your primary market before making the switch, or they will appear to vanish from your system. Additionally, because only one market will be available, it is critical that you set all your vendors, groups, and utility companies to your primary market to avoid loss of this information. If you were using multiple markets to separate properties in our full-scale version of Broker Brain, you can use the Sub Clients feature to do this within Broker Brain Lite. For information on creating sub clients, click here. 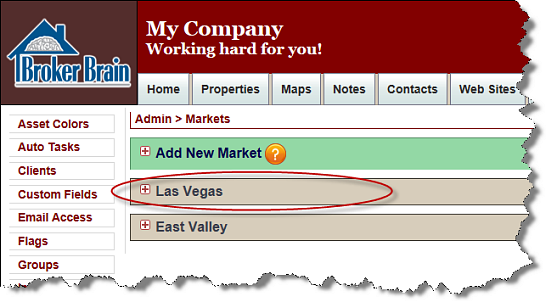 For information on adding sub clients to properties, click here. Note: If you have been using multiple markets in Broker Brain, you will need to perform all three items shown below. If you have been using a single market only, you may move on to step #3. If you currently use a multiple market model, failure to perform one or both of the first two items shown below will result in properties vanishing from your system. 1. Move all vendors, groups, and utility companies to your primary market. Note: Click on the links at left to see detailed instructions for each. 2. Contact Broker Brain Support at support@brokerbrain.net and have us move all existing properties from your secondary markets into your primary market. 3. Any Automatic Email Notifications that were set up under Auto Tasking will be disabled. You will want to review these notifications and make note of any existing emails you may need to replicate and individuals you may need to communicate with throughout your process flow. 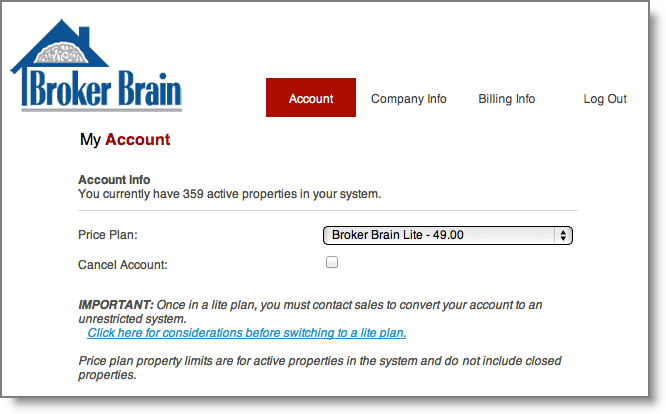 Simply access your Billing page from My Account and select the desired Broker Brain Lite option.